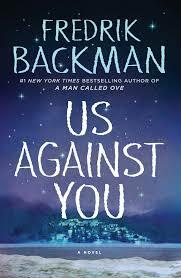 Fredrik Backman makes it three years in a row for best novel, with Us Against You. He takes us back to the remote hockey town of Beartown, which is reeling from the news that the club will likely be disbanded. Most of the junior team are now playing for arch-rivals, Hed, and tensions between the two towns threaten to boil over. By the end of the novel, a resident of Beartown will be dead, and the lives of several others turned upside-down. As always, the characters are beautifully drawn, profoundly flawed and loyal to a fault. A triumph. An outstanding thriller was Desolation Mountain, by William Kent Krueger. The seventeenth in his Cork O’Connor series, this was my first. Cork’s son has a recurring and disturbing vision of a great bird shot from the sky, and so when a plane carrying one of the state’s senators crashes close by, O’Connor and the other Anishinaabeg residents sense something other than the reported mechanical failure lies behind the tragedy. The crash site is quickly closed off by numerous government agencies, and when the witnesses to the crash begin to disappear, O’Connor tries to get to the bottom of things while also protecting his family. If you enjoy taut psychological thrillers with genuine plot twists, then you’ll love The Woman in the Window, by A. J. Finn. Anna Fox has not set foot outside her 4-storey brownstone in almost a year, but keeps up with her neighbors through the powerful lens of her camera. When she sees a new neighbor get stabbed in the chest in her home by an unseen assailant, she calls the police. But when the husband of the supposed victim shows up with the police and his wife (who is not the woman Anna has met), she is dismissed as a reclusive drunkard. A slow start, but the plot picks up pace midway, and then never relents. Good stuff! In ‘clever whodunnits,’ look no further than Magpie Murders by Anthony Horowitz. A famous author dies, apparently taking his own life. His editor has his final novel, but discovers the final chapters are missing. As she tries to track down the missing chapters she begins to suspect that her author may not have taken his own life. Several suspects present themselves – but are the clues to the murderer’s identity ultimately hidden in the novel? We read the novel alongside the real-life action which is an engaging device. Very enjoyable. I’m always happy to find new detective series, and Martin Walker’s Bruno, Chief of Police is delightful. The classic village mystery – this time St Denis in France – his stories are an exquisite blend of simmering tensions, romance and food. I read several others in the series, and along with his insight into France’s culinary culture, Walker also takes on the current racial tension the country faces. In fantasy/science fiction, Tom Miller’s The Philosopher’s Flightwas the standout. Set during the Great War in an alternative version of our world, Robert Weekes, the 18 year old protagonist, is a practitioner of the female-dominated branch of science called empirical philosophy, which harnesses the power to heal, summon wind – even fly. He wins a scholarship to the leading all-women’s school to study, where he struggles against prejudice as he tries to win the respect of his peers. Plenty of action, intrigue, a little romance and very clever. I look forward to the rest of the trilogy. The Fifth Season by N. K. Jemison is the first in another trilogy I intend to complete. Every few centuries, the Evil Earth tries to rid itself of its human inhabitants, and only the feared and despised ‘Roggas’ are able to control the volcanic upheavals that threaten humanity. But most are killed in childhood before they have the chance to learn to control their power. Three (seemingly) separate storylines unfold as another ‘Fifth Season’ dawns. Excellent storytelling. Given that we are apparently living in a ‘post-facts’ era, I thought it was time to finally read George Orwell’s classic of dystopian fiction, 1984. It’s portrayal of totalitarian control is utterly haunting, and some paragraphs seemed to have been lifted directly from our contemporary situation. Disturbing and therefore doing what science fiction is supposed to do. In historical fiction, my favourite this year also has the serendipity of being written by a friend. Jim Wrenn by William Guerrant was inspired by a century-old clipping from his local newspaper. Spanning decades, we follow the fortunes of two children found by a farmer after their mother dies, and who raises them as the children he and his wife could never have. A beautiful story of the love of land and place, with tragedy, sacrifice and integrity at the core, a remarkable first novel by an author who is a farmer himself. I usually find myself reading at least one novel set in the Second World War, and this year was no exception. The Baker’s Secret by Stephen P. Kiernan is the story of Emma and her village in coastal France, struggling under Nazi occupation. Every day she makes 14 loaves of bread from the flour the Germans provide, mixing it with ground straw to stretch it so she can keep 2 loaves to share with neighbors. She begins to network with others – an egg stolen here, fuel siphoned from an army motorcycle for the fishing boat there – as they struggle to survive. The subterfuge comes to light on the eve of the D Day landings, which are described in detail. Powerful storytelling. Finally, as our culture appears to be becoming more understanding and compassionate of people living with mental illness, here are a couple of novels to further that journey. Everything Here Is Beautifulby Mira T. Lee, is the story of two sisters, the older of whom tries to protect her younger sister as her illness slowly asserts itself. First person narratives by the main characters lend an immediacy to this painful story of our powerlessness over illness in the lives of those we love. Well, those were my Top Ten (plus two) novels of 2018. If you’re so inclined, leave me the title of your favorite novel (or two) in the comments!